Haley Lovelace holds a Bachelor of University Studies in string pedagogy and educational psychology from the University of New Mexico. 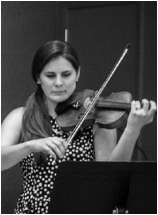 An active researcher in the field of string pedagogy for more than a decade, Haley combines Suzuki and traditional pedagogies as well as developmental psychology in her teaching. Haley’s students have been accepted into the New Mexico School for the Arts and the Albuquerque Youth Symphony Program. Haley is herself an alum of the Albuquerque Youth Symphony and has also performed with the University of New Mexico Symphony Orchestra and the Albuquerque Philharmonic. In her “spare” time she enjoys cooking, time with her toddler Arya, and the Society for Creative Anachronism.